1/4″ ID x 25' (7.6 m) long SteelBraid flex lance features a low bend radius and rugged stainless steel outer braid. 1/8″NPT Male ends. Working pressure up to 8,000 psi (550 bar). For use in tubes with ID of 5/8 in. (16 mm) or greater. 1/4″ ID x 25' (7.6 m) long SteelBraid flex lance features a low bend radius and rugged stainless steel outer braid. 1/8″NPT Male ends. Working pressure up to 10,000 psi (700 bar). For use in tubes with ID of 11/16 in. (17.5 mm) or greater. 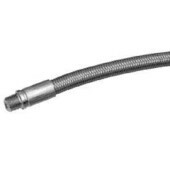 1/4″ ID x 25' (7.6 m) long SteelBraid flex lance features a low bend radius and rugged stainless steel outer braid. 1/8″NPT Male x 5/16″UNEF Male. Working pressure up to 10,000 psi (700 bar). For use in tubes with ID of 11/16 in. (17.5 mm) or greater. 1/4″ ID x 50' (15.2 m) long SteelBraid flex lance features a low bend radius and rugged stainless steel outer braid. 1/8″NPT Male ends. Working pressure up to 10,000 psi (700 bar). For use in tubes with ID of 11/16 in. (17.5 mm) or greater. 1/4″ ID x 50' (15.2 m) long SteelBraid flex lance features a low bend radius and rugged stainless steel outer braid. 1/8″NPT Male x 5/16″UNEF Male. Working pressure up to 10,000 psi (700 bar). For use in tubes with ID of 11/16 in. (17.5 mm) or greater. 1/4″ ID x 25' (7.6 m) long SteelBraid flex lance features a low bend radius and rugged stainless steel outer braid. 1/8″NPT Male x 5/16″UNEF Male. Working pressure up to 8,000 psi (550 bar). For use in tubes with ID of 5/8 in. (16 mm) or greater. 1/4″ ID x 50' (15.2 m) long SteelBraid flex lance features a low bend radius and rugged stainless steel outer braid. 1/8″NPT Male ends. Working pressure up to 8,000 psi (550 bar). For use in tubes with ID of 5/8 in. (16 mm) or greater. 1/4″ ID x 50' (15.2 m) long SteelBraid flex lance features a low bend radius and rugged stainless steel outer braid. 1/8″NPT Male x 5/16″UNEF Male. Working pressure up to 8,000 psi (550 bar). For use in tubes with ID of 5/8 in. (16 mm) or greater. 1/8″ ID x 25' (7.6 m) long SteelBraid flex lance features a low bend radius and rugged stainless steel outer braid. 1/16″NPT Male ends. Working pressure up to 8,000 psi (550 bar). For use in tubes with ID of 1/2 in. (13 mm) or greater. 1/8″ ID x 25' (7.6 m) long SteelBraid flex lance features a low bend radius and rugged stainless steel outer braid. 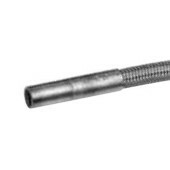 1/16″NPT Male x 1/4″UNF Female. Working pressure up to 8,000 psi (550 bar). For use in tubes with ID of 7/16 in. (11 mm) or greater. 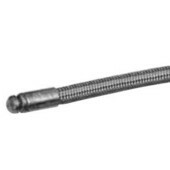 1/8″ ID x 25' (7.6 m) long SteelBraid flex lance features a low bend radius, rugged stainless steel outer braid, and special welded fitting to provide the most compact end possible. 1/16″NPT Male inlet. Working pressure up to 8,000 psi (550 bar). For use in tubes with ID of 7/16 in. (11 mm) or greater. 1/8″ ID x 50' (15.2 m) long SteelBraid flex lance features a low bend radius and rugged stainless steel outer braid. 1/16″NPT Male ends. Working pressure up to 8,000 psi (550 bar). For use in tubes with ID of 1/2 in. (13 mm) or greater.